This condo has been recently painted and is meticulously cleaned. This beautiful lakefront condo is on the 3rd floor with a great view of Lake Erie. 2 BR, 1 BA, sleeps 5, total 900 square feet. It is completely furnished with linen and towels provided. Just bring your personal items and beach towels. Master bedroom has king size bed, TV, and balcony. Guest room has two twin beds. Living room has a queen size fold out couch. Living room also has balcony with patio furniture. Full kitchen and dining area seats up to eight. Newer washer and drier are located inside the unit. In the photograph shown above, Lake Erie is the body of water in the upper right corner. Our unit is in the lower right portion of the complex, nearest the lake. Clubhouse area has beautiful outside heated pool, lounge chairs, hot tub, sauna, and grills for common use. Boat and jet ski docks are available, private marina on Portage River. FREE WIRELESS INTERNET ACCESS. Fully equipped kitchen includes: Dishwasher, Microwave, Coffee Maker, Toaster, Blender, all necessary utensils. Central A/C, two 26' TVs with Cable, CD player, Washer/Dryer inside unit. Paper and cleaning supplies, salt, pepper, sugar and some condiments are routinely supplied. All you need to bring are beach towels and personal items! 1 mile from Jet Express to Put-In-Bay and other Lake Erie Islands. Cedar Point 20-30 minute drive. Fishing charters nearby, jet ski rentals (across the street), Close to wineries, fishing, & golfing. 3 miles from Camp Perry. 10 miles to the Davis Besse power plant. 15 miles from Magee Marsh and Crane Creek. Beaches: Maumee State Park 30 minute drive. East Harbor State Park 10 minute drive. Small beach across the street from complex. Sandy beach in downtown PC 1.5 miles away. No land line phone in unit. Mike and Christine Urbancic have owned and rented this condo since 1995. We live in Cleveland about 1 1/2 hours away and are both retired. We manage the unit ourselves and do all the cleaning and related activities. One of our main goals is to provide a place that is comfortable, clean and worry free for our guests. You can choose the level of activity that you desire - always on the go or relaxing on our 3rd floor balcony or poolside at our private clubhouse area or on the boardwalk in our private marina. 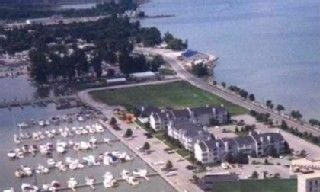 The Clinton Reef Club complex is a beautiful facility with Lake Erie right across the street to the north and the Portage River. to the south. Our managers do a great job of maintaining the entire facility from the clubhouse to the in-ground pool to the private marina to the landscaping of the grounds. It is a very friendly and welcoming atmosphere. The place is located close enough to local establishments, but far enough away so that we are not exposed to the noise of heavy traffic or night time activities. You can see the lake and the river from our two balconies. See photos. This condo was immaculately clean and very conveniently located for access to all area attractions. The owners (MIke & Chris) are very friendly and helpful. They answered all of our questions by email in advance of our arrival. They keep their condo unit very clean and it was a great base from which to explore the area. We truly enjoyed our time at your condo. Met all of our needs perfectly. We enjoyed staying here! Beautiful view of Lake Erie! The condo was nice, quiet, comfortable and conveniently located to the activities that we chose to do while staying in the area. I would recommend the property to anyone and would like to add that the owners are super nice and communication is top priority. If we are ever back in Port Clinton we will certainly try to stay again! Very clean property with everything you need! Loved the view of water on both sides from the balcony! Very easy to rent and great communication with the owners! Visited several beaches during our stay, Put-in-bay, Cedar point, Marblehead lighthouse...so many things to see and do nearby. Great dock area if you are bringing your boat! Definitely would recommend this property! Great location, clean and a real home away from home feeling! We just returned from our 4 night stay at Mike and Chris's condo in Port Clinton and I have to say, it was everything we were looking for in a place to stay. I have never used HomeAway so everything was new. I made the reservation and Mike was quick to answer any questions I had. Our first impression of the condo was how clean it was (big issue for me) and comfortable. It's in a great location with a nice view of Lake Erie. Since we have two teens, we wanted to be close to Cedar Point in Sandusky, but also close to other activities like going to Put-in-Bay Island by Ferry or a short drive up the street to a small beach on Lake Erie. There is a nice selection of restaurants in the area as well. One which we really enjoyed our meal and the atmosphere was Docks Beach House. Although we didn't spend much time in the condo, it was a good feeling knowing that when we returned from a long day of fun, we could feel as comfortable as we do in our own home. It had all the amenities in its description including a pool. If your looking for a nice place to stay, and a great location with great views than I would highly recommend Mike and Chris's condo! Just sorry we didn't get to meet Mike and Chris before we had to leave. Maybe next time! We stayed almost 2 weeks here and it was so nice to have a "home away from home." The condo is exactly as advertised--no unpleasant surprises! It was very clean and we had everything we needed. The location is terrific if you are headed to Camp Perry for the National Matches or any of the many attractions in the area. The condominium complex is very nice as well. We were very pleased.